These rolls are Thanksgiving awesomeness. 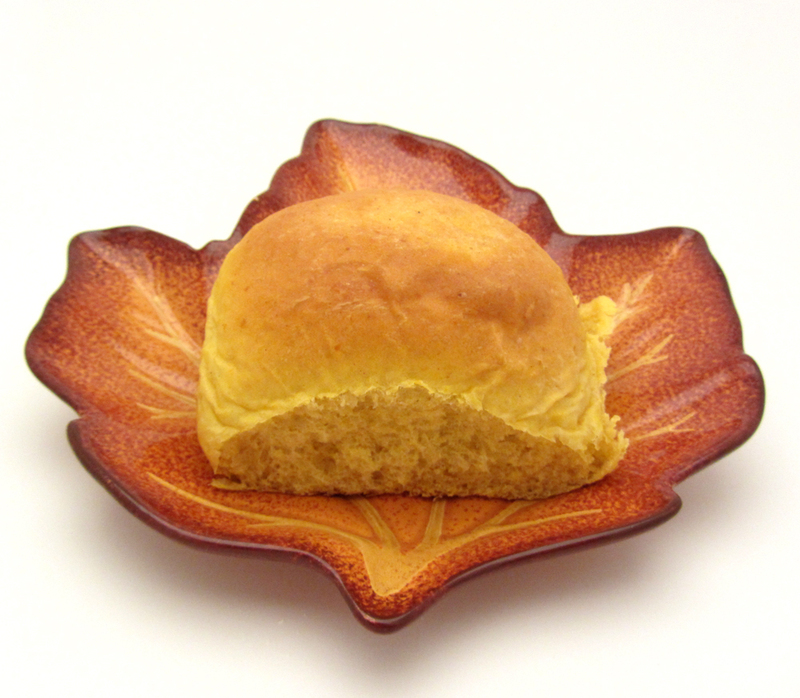 They are tender and soft and slightly sweet with subtle autumn flavor. 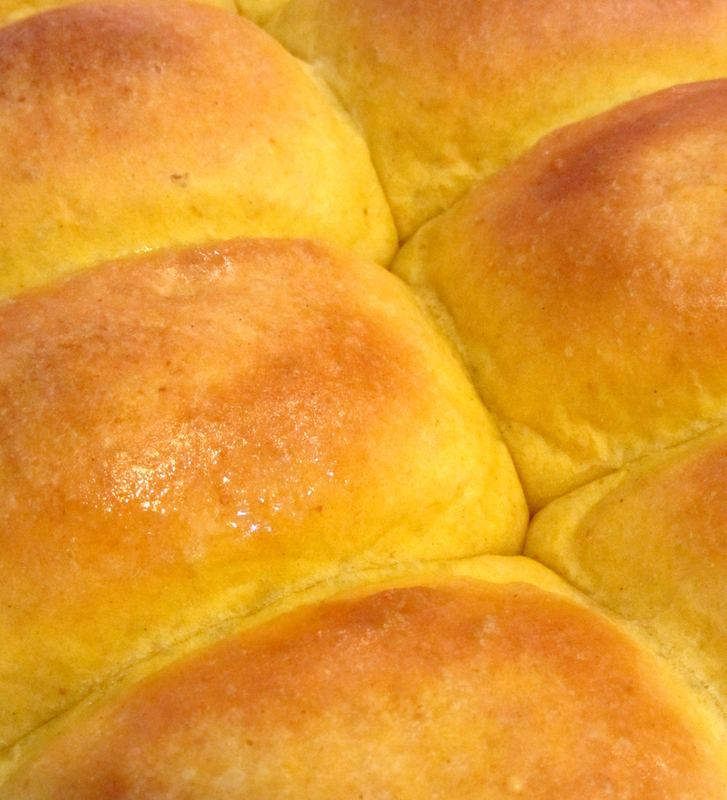 They're a wonderful roll to serve with dinner. And transforming one into a leftover turkey sandwich...well, that would just be perfection. This recipe is adapted from Technicolor Kitchen. It is a must-try. 1. In a small bowl, stir together 1/4 cup of the water and the yeast. Let sit for five minutes to allow the yeast to bloom. 2. In the bowl of a stand mixer, stir together 3 cups of the flour, milk powder, brown sugar, salt, and spice. Add the pumpkin, butter, and remaining 1/2 cup water. Stir to make a shaggy dough. 3. Using the dough hook, knead on medium-low speed for 8 minutes. Watch the dough. It should be tacky and will stick to the bottom, but should clear the sides of the bowl. If it is too wet, add more flour a tablespoon at a time (wait for the added flour to be completely incorporated before adding any more). 4. Gather the dough into a ball. Place in a lightly oiled bowl (the mixer bowl is perfect), turning to coat. Let rise in a warm place until doubled in volume - about 1 1/2 - 2 hours. 5. Line a 9" X 13" baking dish with parchment paper. Lightly oil the dish & paper. 6. Divide the dough into eight equal pieces. Form each piece into a tight ball. Place, evenly spaced, in the baking dish. Lightly spray a piece of plastic wrap with oil. Place the plastic over the rolls. Let rise in a warm place until doubled - about 1 hour. 7. Preheat the oven to 350°. Bake the rolls until they reach an internal temperature of 195°-200° (about 30 minutes). 7. Transfer the rolls to a rack to cool. Serve!